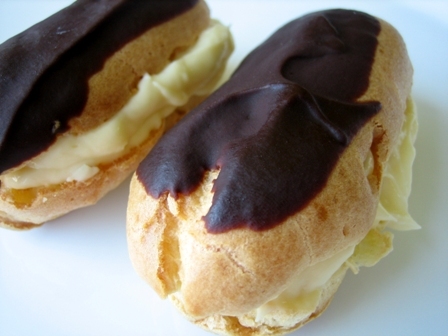 Today is National Eclair Day !! Preheat the oven to 425°F. Lightly grease (or line with parchment) two baking sheets. Combine the water, butter, and salt in a medium-sized saucepan, heat until the butter has melted, and bring to a rolling boil. Remove the pan from the heat, and add the flour all at once, stirring vigorously. Return the pan to the burner and cook over medium heat, stirring all the while, until the mixture smooths out and follows the spoon around the pan; this should take less than a minute. Remove the pan from the heat, and let the mixture cool for 5 to 10 minutes. It'll still feel hot, but you should be able to hold a finger in it for a few seconds. Transfer the mixture to a mixer, and beat in the eggs one at a time; it'll look curdled at first, but when you add the last egg it should become smooth. Beat for at least 2 minutes after adding the last egg. Using a generously filled tablespoon cookie scoop, or a level muffin scoop, drop the thick batter onto the prepared baking sheets in 3- to 4-tablespoon mounds. Space the mounds about 3" apart, to allow for expansion. For éclairs, pipe the batter into 5" logs about 1/2" to 3/4" in diameter. Bake the pastries for 15 minutes, then reduce the oven temperature to 350°F and bake for an additional 25 minutes, until pastries are a medium golden brown. Don't open the oven door while the pastries are baking.